Place the 10 pitted and diced dates into a small bowl with the 3⁄4 cup of water and soak for at least 15 minutes. Place the flour and Pumpkin Pie spice in a large bowl. In a blender, blend the soaked dates, the date soak water, the vanilla, and the non-dairy milk until smooth (1-2 minutes). Pour this into the bowl of flour/spices, and also add the pumpkin, and mix with a wooden spoon until all the dry ingredients are incorporated. Scrape batter into an 8×8-inch baking pan that is lined with parchment paper (or use a non-stick silicone baking pan). Cook for 25-30 minutes at 375ºF. (If you see a light browning and some cracks on the top, these are good indications that it’s done.) Let cool at least 10-15 minutes before cutting and serving. 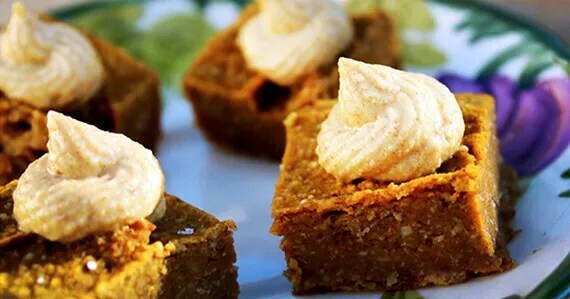 Optional: Finish with Macadamia-Vanilla Frosting (recipe below) just before serving, or top with a light dusting of grated macadamia or other nuts (using a rotary cheese grater). Storing in the refrigerator overnight will firm up these squares, then you can pack them in a lunch or as a snack. This frosting has a somewhat maple flavor to it. You can use it right after making it, or if you want to use a cake decorating tip (like in the top photo), put the frosting in the refrigerator for 30 minutes first. Drain the soak water off of the nuts and discard it. In a blender, blend all of the ingredients (nuts, dates with their soak water, and vanilla) until smooth and even in color. Add a little more water as needed to keep the blender moving if it gets too thick. Using fresh pumpkin: If you want to use fresh pumpkin instead of canned, cut the pumpkin in half lengthwise, remove all the seeds and stringy fibers, and then place cut-side down in a baking pan. Bake at 350ºF for approximately 45 minutes to 1 hour (depending on size) or until easily pierced with a knife. Scoop out the pumpkin flesh, and puree in a food processor until smooth. If you want to extract the excess liquid (this will result in a firmer dessert), line a regular kitchen strainer with cheesecloth and strain the liquid off the pumpkin puree. I have also scooped the pureed pumpkin into the center of a large piece of cheesecloth, tied it off at the top, and hung it up to drain over a bowl for a couple hours. Cool the puree before using. Pumpkin pie spice substitution: If you do not have pumpkin pie spice on hand, you can substitute with 1 ½ teaspoons cinnamon, ½ teaspoon nutmeg, 1/8 teaspoon clove; or a close approximation. Pans: I use an 8×8-inch Pyrex pan here, but you can also use a lined pie or cake pan, and then cut the pieces to look like pumpkin pie slices. Texture: For a firmer texture without refrigerating overnight, only use 1/2 cup of the date soak water (instead of 3⁄4 cup).